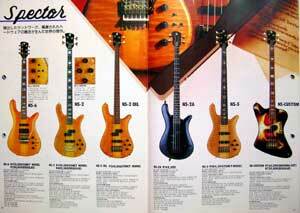 Greco Guitar Catalog 1990 by Kanda-Shokai Co. that is a then Japanese import agency. Cover : A.Watanabe and K.Nakayama. They were bassist and guitarist of Japanese woman band the Princess-Princess. Left to Right : NS-6 guitar, NS-2 high gloss finish, NS-2OIL oil finish, NS-2A inexpensive Korea model, NS-5 (different head shape now) and an amazing thunderbird non-reverse skeleton finish Nikky six model NS-CUSTOM. Oil finish was not standard finish in those days.